You know. 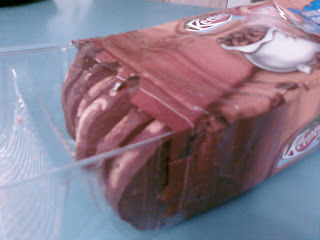 You pull the cookie tray out to get just one cookie, and then … you can’t jam the plastic tray back into the outer sheath. The clear plastic tray starts to buckle, the cookies bulge out. Yep. Forced to eat an ENTIRE row. Which reminds us that most marketers fail to structure their own upsell moments. Every time a customer uses your product, you have an opportunity to get them to use more. We recently spoke with a gift company and suggested they send direct mail to new customers about two weeks after receiving the gift by mail, when the customer was still high on the product experience. Would everyone buy more? No. But the response rates should be double that of people who never tried the product. So thank you, Keebler, for the inspiration. We’re sure this little package moment accelerates the repurchase pattern and drives up your revenue and profits. Now will someone please stop us.